While on an internship through Emzingo in Peru, Graeme worked in international tourism to promote a local product to the international market. 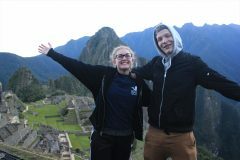 As a cultural excursion, he hiked to Machu Picchu with fellow Carleton student, Holly Laurenzio. Patrick presents a lesson to third grade students, while interning at an International School in India. 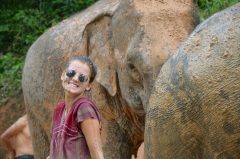 While in Thailand interning with a local animal shelter, Holly enjoys a cultural experience, volunteering at an elephant sanctuary. 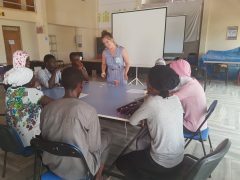 Bridget is engaging young people in a word association game during one of EQWIP HUBs’ weekly training sessions/workshops to assist them in building skills that are relevant to the job market. Holly Laurenzio worked in community development as a Fundraising and Marketing Consultant through Emzingo. 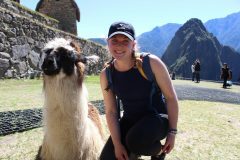 While on a cultural excursion, she snapped this picture with a sleepy llama in Cusco, Peru. Morgan is pictured visiting Cu Lao Cham – Hoi An to celebrate the anniversary of the area having been recognized as a UNESCO heritage site. 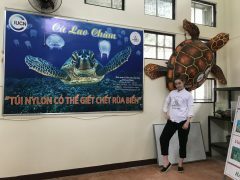 On her internship, she worked with a local biosphere reserve, conducting research and drafting English articles surrounding topics such as plastic waste, ecotourism, and the protection of biodiversity. Keean meeting H.E. The Most Hon. 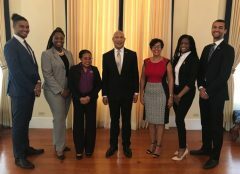 Sir Patrick Allen, Governor General of Jamaica, while on an internship through Grace Kennedy, where he worked for a Senator and reconnected with his Jamaican roots. 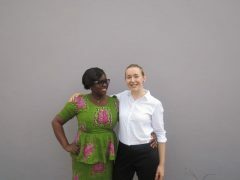 Kirstin smiles next to Letitia, a female entrepreneur, owner and CEO of Samba foods, whom she interviewed as part of her internship with World University Services Canada while working on a research project looking for Southern Based Gender Lens investors.